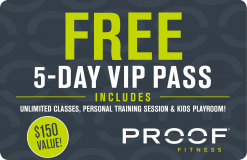 Studio Proof is an innovative and dynamic class experience that keeps your fitness routine anything, but boring. Together, we can accomplish so much more. Together, we can go beyond the goals we set for ourselves. Together, we are Studio Proof. Get a sneak peek of some of our classes below, and fill out the form to get your first class FREE! Feel energized, and challenge your concentration with extended balance poses focused on core work, balance, strength and stamina. Keep your heart rate pumping with this challenging cross training class that combines hi-intensity intervals of cardio and strength training. Increase your speed, agility & strength in a classic boxing class, while burning calories all the way to the final KO Round! You’ll enjoy this heart-pumping session. HIIT the Barre is a favorite among Proof Fitness members. HIIT (High Intensity Interval Training) holds steady among the top fitness trends. Cardio, strength, and heart rate training. Reach your OPTIMUM heart rate and metabolic zone, and burn calories long after class is over! Through the mindfulness of Yoga, you will change your body and your life, becoming your most POWERful self. A fusion of cycling, rowing and strength training in one 60 minute class blast. Fusion is one total-body workout! Beatz is 60 minutes of high energy cardio, set to the beat of the music. Get ready to sweat and move on the bike like you’ve never moved before. This class will pump you up! This session introduces challenging intervals of rowing and toning exercises, completing AMRAP. This 45 minute class will amp up your rowing! Some people call it Boot Camp, we call it AMP’D … Accelerated Movement & Proven Dynamics. AMP’D includes extreme circuit training with a full body blast of strength and conditioning. A system of controlled exercises that engage the mind and condition the body, this class expands beyond the basic Pilates. 60 minutes of muscle defining strengthening and sculpting! Perfect resistance training define your body. This fluid dance-inspired class is set to an upbeat music selection at a vigorous pace to get your heart pumping. One heart-pumping workout that consists of 45 minutes of hills, flats, sprints, jumps, tabatas and power accelerations on a stationary bike!